Recently moved to London? Bored of the same food joints? Want to see and try something new (for dinner that is)? If you have recently arrived in the city, by all means tip your house removals guys and pay attention! If you are a local cat who is looking for some fresh and original lunching and dining options – pay attention too as below you will read about some of London’s quirkiest and most unusual eating spots. The Sketch – a dining complex that gives patrons freedom of choice and unbelievable surroundings in which even cheeseburgers will taste exotic! At The Sketch eating and drinking becomes a whole new experience. Patrons say the hardest part about eating at The Sketch is choosing in which of the stunning rooms to do it! Patrons can choose from an elegant, two-star rated Michelin restaurant – the Lecture Room, a woodland themed lunch venue – Glade, the brasserie style Gallery, The Parlour – an eccentric patisserie, and a general style restaurant and bar. Choice is entirely yours! Les Trois Garcons – this particular venue, situated in Shoreditch is indeed a genuine one-off. If you have recently moved to Shoreditch (thank your house removals guys for the job i.e. tip them) and if you are left with some cash to spare book a table at this amazing eating spot, popular with many high rollers and celebs (or so they say). Les Trois Garcons is a former pub which is now a deluxe French bistro. The decors feature outrageous interior objects and features and some fantastical furniture. Those in the know say there is something very decadent about dining Anglo-French cuisine while staring in the eyes of a tiger that has been the project of a taxidermist (meaning stuffed, guys). Dans Le Noir? 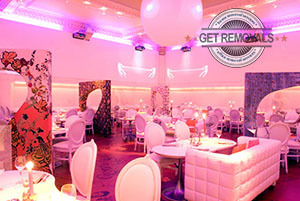 – This dining venue is one of the most unique places in the city. The restaurant is situated in Clerkenwell, and the entire dining experience takes place in complete darkness, not because it is in Clerkenwell (don’t listen to all the mythology coming from the house removals people) but simply because the waiters serving you are visually impaired. Patrons have noted that Dans Le Noir is a complete experience which challenges your sense of taste, smell and of course perception. The surprising menu will also educate you and your palate about many previously un-encountered tastes and flavours. Inamo – if you are into gadgets and embrace cutting edge technology, then why not go for a high-tech dining experience in this very special Asian fusion cuisine restaurant! Inamo features a pioneering interactive ordering system which projects images directly on the table you are sitting on. Meals and drinks are ordered through a special 3D menu. The guys went as far as giving guests a choice from different 3D tablecloths! The restaurant’s unique interactive ordering system can call you a cab home or provide you with useful info on a specific neighbourhood or suburb – great news if you recently moved to London, but the house removals guys weren’t too knowledgeable about fine dining and wining.